Hola Lola: It's me time!!! Man, I'm excited!!! I'm taking a week vacation. No plans. Just going to have some much needed me time. So, what will I do with all this time? Well, I'll get a pedicure. Haven't had one since the day I went into labor. I'll also clean out and organize closets. I need to get rid of a ton of clothes. I'll go to several backyard fitness classes. This is fun. It's a group of mom's I found that work out in this ladies beautiful backyard. Kids can go and entertain themselves and mom's can get a good workout in and let me tell you...the work outs are tough. I'll also complete my weekly runs. I'll go watch a movie. I'm thinking maybe I'll see The Hangover, Whatever Works or Away We Go. Shoot...maybe I'll see all three....why not?!?!? I'll take Lola to school every morning but will probably pick her up early and we'll either go to the local park and swim/play on the playground or go to Barton Springs. I'll also go to Dallas to visit everyone and get my hair highlighted. Maybe my mom and I can go hit up some of my favorite Dallas shopping spots. It will be easy to convince her to buy Lola something new and cute and maybe I can even convince her to buy me something new and cute....not that I need anything. I'm really looking forward to this...it is going to be heaven all wrapped up into one week of vacation. Can't wait!!!! I still don't have our new camera so I have to go back to some of my old albums. 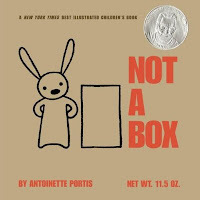 Lola loves the book "Not a Box" - it has simple line drawings of a rabbit and a box. The author dedicates the book "to children everywhere sitting in cardboard boxes" and celebrates the magic a large box brings to a child. The book opens with a question: "Why are you sitting in a box?" The young rabbit replies, offended, "it's not a box." And the illustration shows him sitting in a race car. And, so on. Rabbit climbs a mountain, fights a fire, wears a robot costume. His box is anything, but "it's NOT NOT NOT NOT a box!" '. It is a really cute book! Lola loves to play with, in, on and around boxes. This particular evening she was having a blast inside the box . Who knows what the box actually was to her b/c I'm sure it was "not a box". 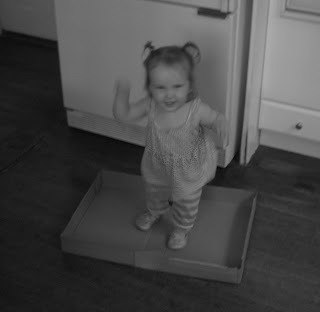 You gotta love a kids imagination and the fact that something as simple as a box can bring a child so much joy!